There’s nothing small about the generosity being shown by the restaurant Phat Daddy’s. This is the seventh year for the London eatery to host its free Thanksgiving dinner. Starting at noon on Thanksgiving day, doors will be open for anyone to stop in and pick up a free dinner or dinners to take home. Dinners can also be delivered if orders are called in. This year’s menu consists of turkey, ham, dressing, potatoes, corn, baked beans, rolls, and pumpkin pie. Dinners are available until supplies run out. The dinners are provided through the generous donations of local individuals and businesses. Orders for delivery can be placed by calling 740-852-3339 on Wednesday. 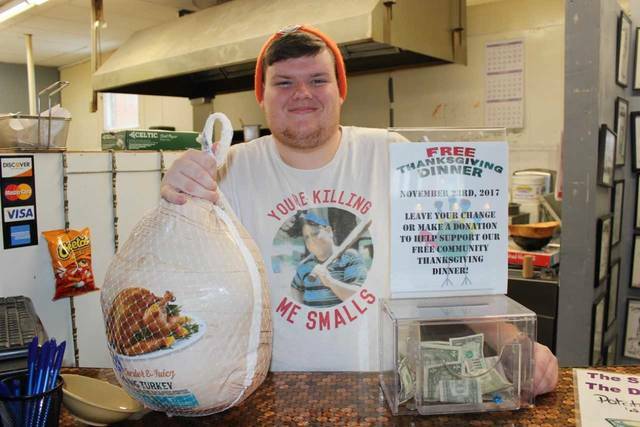 Pictured is Phat Daddy’s employee Skylar Virts with one of the turkeys donated for the dinner.